Instant enhancement. Amazing portraits. One-click effects. What Can You Do with PhotoWorks? Fix over/underexposed or blurry shots in seconds. Get rid of lens distortion and correct perspective errors. Remove small and big items with no trace left behind. Try the smart Healing Brush and the versatile Clone Stamp. Give your pictures that special vibe with popular photo filters: black & white, vintage, HDR, color splash, etc. Make dull colors pop thanks to selective color correction. Fix unnatural colors and add vibrance to your landscape photos. Add a professional finish to your portrait shots: smooth out skin texture and tone, whiten teeth, change eye color! Turn an ordinary picture into a trendy poster - a huge choice of cool effects and ready-to-use text styles is there to help. 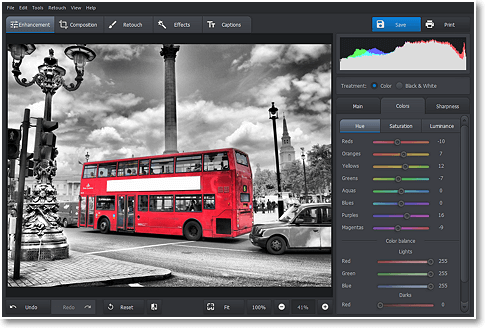 Take a Glimpse Inside This Photo Editor for PC! 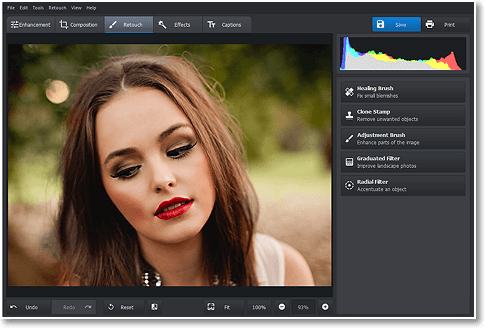 PhotoWorks is a powerful yet easy to use photo editor, equally good for beginners and expert photographers. With its intelligent tools and numerous presets, it makes post processing mere fun. Give your portraits a polished look, or turn an average landscape shot into a masterpiece for free! There's all you need to improve image quality and fix common flaws - from instant lighting correction to versatile retouching brushes. 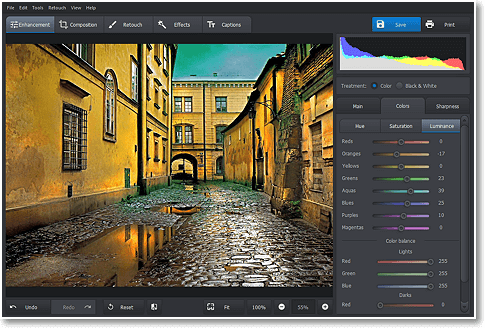 In a word, there's everything to make PhotoWorks your perfect photo editing software for PC. 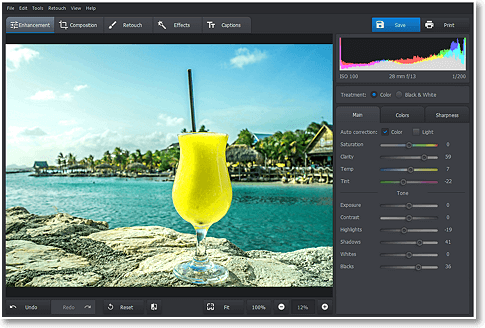 Download free trial now and get immediate access to the complete editing toolkit, built-in collection of photo filters, and rich fonts gallery. Thanks to innovative image processing algorithms, PhotoWorks can deal with any problem caused by your camera's shortcomings or poor lighting. Correct exposure and white balance to achieve a natural look, tweak highlights and shadows to bring out details, change the image temperature and tint, sharpen a blurred photo and increase clarity, or remove glare from photos in a number of ways. The software boasts exceptional editing quality, previously available in expensive professional programs only. One of the coolest things that sets PhotoWorks apart from most standard image editors is that it lets you make any changes to the image without the fear to harm the original, and you can undo any action with losing the rest of your work. For example, you crop your photo and make it black & white, then do some retouching and add a caption, and then decide to revert the crop or bring the color back - that's no problem at all! You can undo the very first action, and all the other changes will be saved - it's just that simple. Another awesome feature is the ability to work with a certain color on the picture, while all the other colors remain untouched. Change the hue of your dress or car in a second - with no need to do any manual selection! The software uses smart technology to find the necessary area by itself. In the same way, you can make the blue sky or green grass more saturated and vivid. And if you use this trick combined with a retouching brush, you'll be able to change eye color and apply makeup right on the picture. Background is an essential part of any photo that can put a positive spin on it or completely spoil its beauty. Don't want all of your hard work of posing and capturing to go in vain? The great news is you can easily make your picture attractive by changing the background or removing unwanted things in post production. PhotoWorks can add background to a photo and transfer your digital self to any exotic place you can dream of - a busy street, tropical beach, lovely garden, and much more. 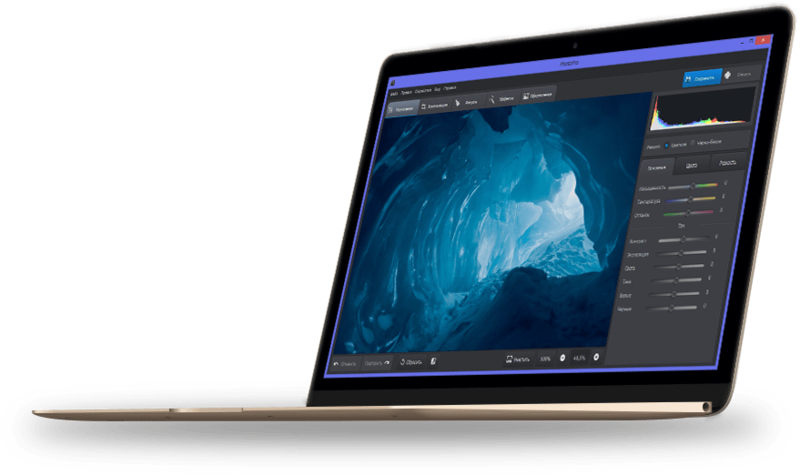 Even if you're just an amateur photographer and can't tell your highlights from your shadows, you'll be totally comfortable with PhotoWorks - definitely more than with its more advanced professional alternatives. No complicated settings like levels and curves that require months of learning - intuitive sliders and ready-to-use presets let you achieve a smashing result in no time. 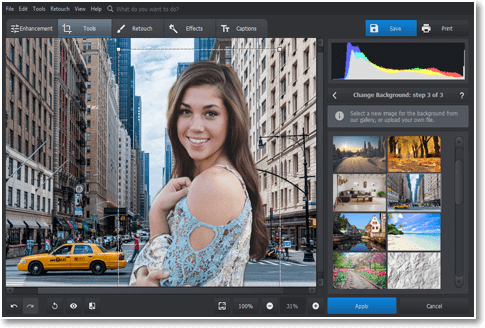 So if your pictures need some help, you've come to the right place to download photo editing software that'll make them perfect. Get started free right now! All effects are instantly available after download!